The great thing about stand up paddle surfing right now is that there are some new brands coming into the market. I had been hearing abou these boards for a while, then at the BSUPA Swansea event I got a chance to see them in the flesh. They are certainly eye catching! When I picked them up I also found out how light they were. SUPGlobal have managed to get one of the 7ft 8" Fish Art boards to have a go on, now we are just awaiting the first autumn swells ! In it’s simplest term the Celtic phase ‘Nah Skwell’ translates into ‘Playground’. Based in Brittany in the North Western corner of France, which shares strong links to other Celtic Nations such as Cornwall, Wales & Ireland, Nah Skwell are a new range of SUP designed, shaped and tested in Northern European Waters. Over the past few years, the team of Pascal Gerber and Bruno Andre were longing to combine their experience in designing windsurf, sup-wind and surf boards with their now lengthy experience of this new sport an experience which they infused into the rest of the company staff. The passion of their to desire to create has resulted in a focused board range that consists of a 10’6”, 9’6” & a 7’8”. Nah Skwell boards are innovating and a different style of SUP. Our goal has been to allow the rider to discover the shapes potential (and not its limits), Step after step. We want them to progressively find their board’s capabilities, and enjoy their own progress during every session. This is why we offer smaller, less voluminous, less cumbersome, but lighter, livelier and more performing boards, combined with a fresh/funky looking practical deck pad that draws the public to them. Over view of the range. With a flattish shape and a pinched tail, the 10’6” will glide easily whether cruising or playing with small and medium waves, no need to get the trouble of carrying a 12’ SUP anymore. Voluminous and rounded on the forward 2/3rd, the 10’6 rails end up very thin to enhance manoeuvrability in the surf. This is a stable and friendly board in the surf, the 10’6 will give you much fun and enjoyment in the waves. Thickness has been carefully balanced along the board, which gives it good stability in a lower volume than the current standard boards. The 10’6 rider will enjoy a lighter board (11kg with fin) reacting in a much livelier way to foot pressure. Its shape is slightly veed and hollowed along the whole scoop line; this Vee is increased at the aft kick level to increase maneuverability, while a spoon has been designed forward to help nose riding. End user – Any surfer, cruising, nose riding! The Nah Skwell 9’6 is a perfect compromise for those who like SUPing in waves. A very compact and lively board, it will complete short radius and fast turns, while retaining a stability known only on 11’ ‘old-generation’ boards, till now. This innovative shape comes from a full re-thinking of SUPing standards. No need anymore for heavy and large volume boards, when a 9’6 can be more stable and livelier at the same time! The 9’6 volume repartition is perfectly balanced and guarantees a very good stability when standing still. Its bottom shape features a slight hollowed Vee, which is increased at the aft kick, and a spoon forward. Rails are quite voluminous on their full length. This is an easy-to-paddle board, with good, even if lower than that of the 10’6, directional stability. The Nah-Skwell 9’6 gets lively from the first small wave, while remaining an easy board all along. That’s this board’s strong point; it turns easily and is light under the feet, even for a beginner! A good rider shall discover a performing shape, sharp turns capable, and which will allow any long-board trick. Fast and maneuverable in the waves, it’s a three fins board. While stable on flat water, this is not a dedicated long distance board, due to its rather curved rocker. This All-Round 9’6 will fit a beginner looking for his first true surfing sensations, as well as an excellent rider looking for a board that delivers in any surfing condition. 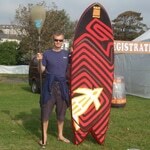 The Nah-Skwell 7’8", is a highly competitive stand-up paddling short-board. Already very radical in smallish waves, it will allow the most experienced riders to attack waves up to 2.5m. In less than 1m waves, this is the ultimate weapon, which allows the rider to throw curve after curve with a true high speed. With no other comparable board in today’s market, this is a board for fully dedicated SUPers looking for extreme sensations and high performance. We have designed a 100% SUP Fish. Starting from a "retro" outline, we have reversed the aft section. This makes for a less powerful tail; curves can be sharpened at any time, just as if the shape had a lot of kick, while speed is unharmed. The 7’8 bottom sports a slightly hollowed Vee along its full length. Rails are rather thin but rounded. This low volume board (130L) has the maximum carrying power forward. This requires a minimum paddling expertise and a good placement at the peak, for a proper take off. Fitted with 19cm twin fins, our 7’8 pivots extremely well. An explosive board in small waves, its very refined tail allows the rider to try and surf sizeable waves without loosing control or stability. Enjoy your own style! Nah Skwell – let every wave and every stretch of water become your playground. Next articleSUPing: An Introduction by a Novice.